TORONTO , Feb. 19, 2019 /CNW/ - Golden Star Resources Ltd. (NYSE American: GSS; TSX: GSC; GSE: GSR) ("Golden Star" or the "Company") announces an updated Mineral Resource estimate at Father Brown consisting of the Father Brown Zone and Adoikrom Zone. Inferred Mineral Resources have increased from 246,000 ounces at year end 2017, to 474,743 ounces, representing a 93% increase. The stated Mineral Resources were prepared under the supervision of S. Mitchel Wasel , Vice President of Exploration for the Company. Mr. Wasel is a Qualified Person as defined in NI 43-101. "I am encouraged by the results we are seeing at Father Brown, and given the proximity of the deposit to the existing Wassa plant and infrastructure, Father Brown has the potential to demonstrate significant organic growth for Golden Star. With this latest information, we will be looking at the economic viability of the two mineralized structures whilst we continue to test the inferred potential at depth and will undertake a conceptual mine planning exercise which will guide our next phase of drilling expected to convert material into the Indicated Mineral Resource category. We expect to make a decision on accelerating the drilling in Q2 2019, and will notify the market accordingly." In 2019, a drilling budget of $1.5 million will be allocated to inferred expansion drilling of 9,000 metres. Further drilling will be assessed to expand the Inferred Mineral Resources and drill off the Inferred Mineral Resources to seek to upgrade them to the Indicated Mineral Resource category. The initial drill planning at Father Brown was to systematically drill below the historic open pits and try and extend the existing Inferred Mineral Resource of 1.5 Mt grading 5.1 g/t. Drilling results were sporadic until the orientation of the high-grade plunge at Adoikrom was identified. 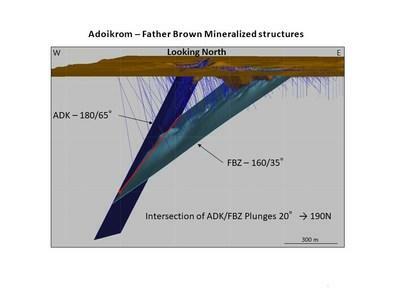 Holes FUG18DD002, 003, 004 and FUGDD19016A all intersected wider higher-grade zones that now define the moderate 65 degree plunge of the Adoikrom gold mineralization. The drilling targeting the Father Brown structure at depth has not identified continuous gold mineralization at depth, directly below the pits. However detailed mapping and variography has determined that the gold mineralization associated with this structure may be plunging shallowly to the North. The Company's geologists are now drill testing the down plunge extensions of Father Brown and this will be the focus of the programs in the coming weeks. All widths quoted in this press release are estimated true widths. The full set of intercepts, including the drilled widths, are included in Appendix A. The Inferred Mineral Resource estimate was created by Golden Star geologists utilizing Leapfrog Edge, geological modeling software. The wire frames were created using the vein modeling application in Leapfrog and grades were estimated into a block model using Ordinary Kriging. The deeper drilling has helped identify the plunge of both of these mineralized structures and it is these horizons which host the higher grades and are now the focus of the current follow up drill programs. Golden Star also announces that Robert Vallis had been appointed as Senior Vice President, Corporate Development. Mr. Vallis is a seasoned Corporate Development professional with over twenty years of experience in the mining sector. Most recently, Robert held the position of Vice President, Business Development at Yamana Gold Inc., and prior to that was employed by Barrick Gold Corporation. The Company wishes to thank Bruce Higson-Smith for his years of service at Golden Star, and wishes him well in his future endeavours. Golden Star is an established gold mining company that owns and operates the Wassa and Prestea underground mines in Ghana , West Africa . Listed on the NYSE American, the Toronto Stock Exchange and the Ghana Stock Exchange, Golden Star is focused on delivering strong margins and free cash flow from its two high-grade, low cost underground mines. Gold production guidance for 2019 is 220,000-240,000 ounces at a cash operating cost per ounce1 of $620 - $680 . As the winner of the PDAC 2018 Environmental and Social Responsibility Award, Golden Star is committed to leaving a positive and sustainable legacy in its areas of operation. Some statements contained in this news release are "forward-looking statements" within the meaning of the Private Securities Litigation Reform Act of 1995 and "forward looking information" within the meaning of Canadian securities laws. Generally, forward-looking information and statements can be identified by the use of forward-looking terminology such as "plans", "expects", "is expected", "budget", "scheduled", "estimates", "forecasts", "intends", "anticipates", "believes" or variations of such words and phrases (including negative or grammatical variations) or statements that certain actions, events or results "may", "could", "would", "might" or "will be taken", "occur" or "be achieved" or the negative connotation thereof. Forward-looking information and statements in this press release include, but are not limited to, information or statements with respect to: the ability of Father Brown to provide significant organic growth for the Company; the allocation of $1.5 million to the drilling budget at Father Brown, and the Company's ability to convert Inferred Mineral Resources to Indicated Mineral Resources at Father Brown. Investors are cautioned that forward-looking statements and information are inherently uncertain and involve risks, assumptions and uncertainties that could cause actual facts to differ materially. There can be no assurance that future developments affecting the Company will be those anticipated by management. We expect that these estimates will change as new information is received. While we may elect to update these estimates at any time, we do not undertake any estimate at any particular time or in response to any particular event. The Mineral Resource estimates have been compiled by the Company's technical personnel in accordance with definitions and guidelines set out in the Definition Standards for Mineral Resources and Mineral Reserves adopted by the Canadian Institute of Mining, Metallurgy, and Petroleum and as required by NI 43-101. The Mineral Resource technical contents of this press release have been reviewed and approved by S. Mitchel Wasel, BSc Geology, a "Qualified Person" pursuant to NI 43-101. Mr. Wasel is Vice President Exploration for Golden Star and an active member of the Australasian Institute of Mining and Metallurgy. The 2018 and 2017 estimates of Mineral Resources were prepared under the supervision of Mr. Wasel. The results for Father Brown stated herein are based on the analysis of saw-split HQ/NQ diamond half core or a three kilogram single stage riffle split of a nominal 25 to 30 kg Reverse Circulation chip sample which has been sampled over nominal one meter intervals (adjusted where necessary for mineralized structures). Sample preparation and analyses have been carried out at Intertek Laboratories in Tarkwa, which are independent from Golden Star, using a 1,000 gram slurry of sample and tap water which is prepared and subjected to an accelerated cyanide leach ("LEACHWELL"). The sample is then rolled for twelve hours before being allowed to settle. An aliquot of solution is then taken, gold extracted into Di-iso Butyl Keytone ("DiBK"), and determined by flame Atomic Absorption Spectrophotometry ("AAS"). Detection Limit is 0.01 ppm. All analytical work is subject to a systematic and rigorous Quality Assurance-Quality Control ("QA-QC"). At least 5% of samples are certified standards and the accuracy of the analysis is confirmed to be acceptable from comparison of the recommended and actual "standards" results. The remaining half core is stored on site for future inspection and detailed logging, to provide valuable information on mineralogy, structure, alteration patterns and the controls on gold mineralization. This press release uses the term "Inferred Mineral Resources." The Company advises US investors that while this term is recognized and required by NI 43-101, the SEC does not recognize it. "Inferred Mineral Resources" have a great amount of uncertainty as to their existence, and great uncertainty as to their economic and legal feasibility. It cannot be assumed that all or any part of Inferred Mineral Resources will ever be upgraded to a higher category. In accordance with Canadian rules, estimates of Inferred Mineral Resources cannot form the basis of feasibility or other economic studies. US investors are cautioned not to assume that any part or all of the Inferred Mineral Resource exists, or is economically or legally mineable.